The prices are set according to the period of use, room type and number of occupants. Changes in booking dates, number of people and type of accommodation will entail changes in prices. The consummation of the bar and / or refrigerator room are not included in prices. The stay begins at 13 h and ends at 12 pm, with additional charges for the customer who choose to arrive early or leave late. Only after the payment of the first installment combined the reservation is guaranteed. 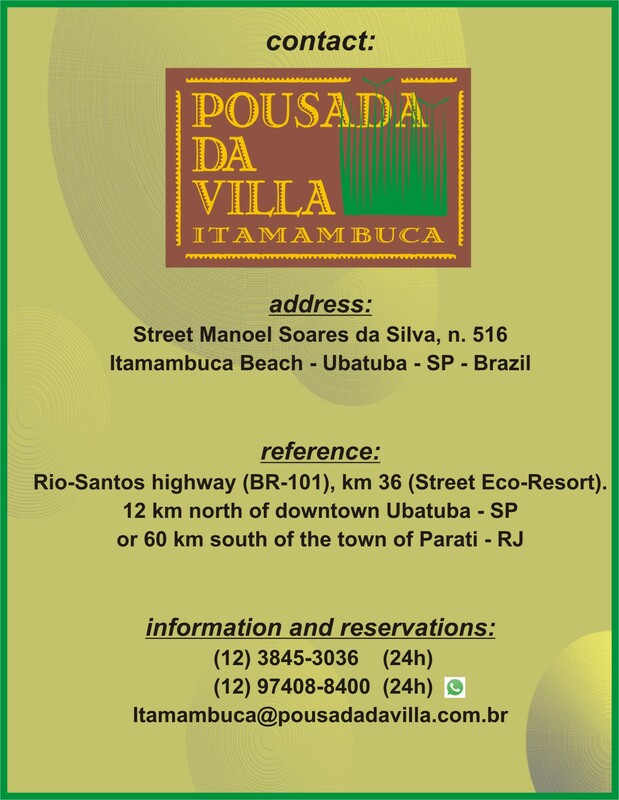 Having the need to cancel or change the reservation, the customer must give written notice (e-mail) to the Pousada Villa, no cancellation or amendment being accepted by phone. According to legal requirements in general and in particular with the provisions of Normative Resolution No. 161/95 of Embratur, cancellation or amendment will be subject to collection of fees and fines as conditions below. - 15 days prior to arrival date for peak season, according to the availability of the Inn (no changes will be made in the New Year and Carnival packages). - 07 days prior to arrival date for low season, according to the availability of the Inn. up to 15 days before the start of the package or daily, will be refunded 100% of the total amount paid, discounting the rate of cancellation and refund. - Between 14 and 10 days, will be charged 30% of the amount paid. - Between 09 and 05 days, will be charged 60% of the amount paid. - Between 04 days until the start of the day will be charged 100% of the amount paid. - Between 14 and 7 days will be charged 50% of the amount paid. - Between 06 days until the start of the package will be charged 100% of the amount paid. Cancellation of reservations for groups and events Asked 30 days or more from the beginning of the package, there will be fine for 10% of the amount previously paid and refund the remaining amount. - Between 06 days until the start of the package will be charged 100% of the package. Withdrawal without cancellation - "no show"
Non-attendance without prior notification in writing (e-mail), the scheduled arrival date will be considered "no show" (withdrawal without cancellation), with retention of 100% of the amount paid. The withdrawal of stay after entry or cancellation of a service included in the package, will not be entitled to any refund, resulting in the total loss of the amount paid for the package. As well as early departure will not be entitled to cash refund or credit on new everyday. Respecting Standards of Sanitary and Municipal and State Laws that prohibit animals on the beach, do not accept animals brought by guests within the hostel, getting paid by the customer burdens arising from breach of this rule.